In 2005, 32% of Métis children under 6 lived in low-income* families – compared to 18% of non-Indigenous children. 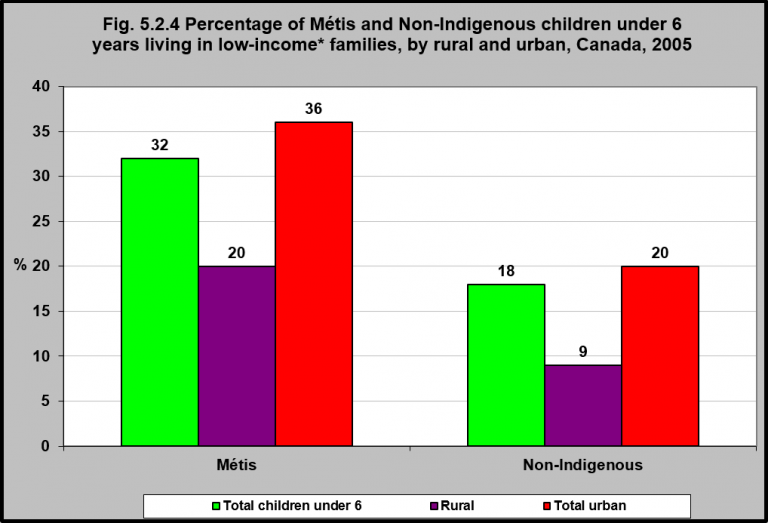 Rural Métis children were less likely to live in low-income families (20%) compared to urban Métis children (36%). Rural non-Indigenous children were also less likely to live in poverty compared to urban non-Indigenous children. Métis children are less likely to be living in low-income families as compared to First Nations children (on and off reserve); however, they are still much more likely to be living in low-income families as compared to non-Indigenous children. Like First Nations children, urban Métis children are considerably more likely to be living in low-income families compared to non-Indigenous children.